Background: Cancer is a major cause of death worldwide, despite many different drugs available to treat the disease. This high mortality rate is largely due to the complexity of the disease, which results from several genetic and epigenetic changes. Therefore, researchers are constantly searching for novel drugs that can target different and multiple aspects of cancer. 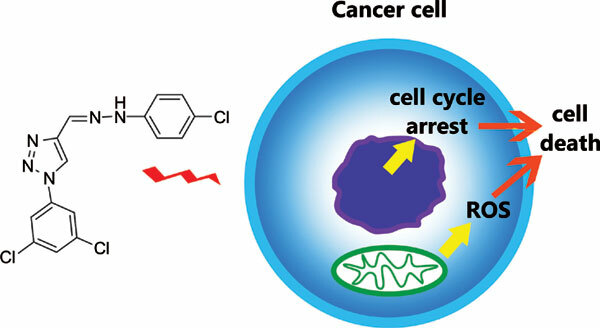 Experimental: After a screening, we selected one novel molecule, out of ninety-four triazole derivatives, that strongly affects the viability and proliferation of the human breast cancer cell line MCF-7, with minimal effects on non-cancer cells. The drug, named DAN94, induced a dose-dependent decrease in MCF-7 cells viability, with an IC50 of 3.2 ± 0.2 µM. Additionally, DAN94 interfered with mitochondria metabolism promoting reactive oxygen species production, triggering apoptosis and arresting the cancer cells on G1/G0 phase of cell cycle, inhibiting cell proliferation. These effects are not observed when the drug was tested in the non-cancer cell line MCF10A. Using a mouse model with xenograft tumor implants, the drug preventing tumor growth presented no toxicity for the animal and without altering biochemical markers of hepatic function. Results and Conclusion: The novel drug DAN94 is selective for cancer cells, targeting the mitochondrial metabolism, which culminates in the cancer cell death. In the end, DAN94 has been shown to be a promising drug for controlling breast cancer with minimal undesirable effects. Keywords: Reactive oxygen species, Cell cycle, Viability, Cancer, Apoptosis, Novel triazole. Keywords:Reactive oxygen species, Cell cycle, Viability, Cancer, Apoptosis, Novel triazole. Abstract:Background: Cancer is a major cause of death worldwide, despite many different drugs available to treat the disease. This high mortality rate is largely due to the complexity of the disease, which results from several genetic and epigenetic changes. Therefore, researchers are constantly searching for novel drugs that can target different and multiple aspects of cancer.